Instrument P.I. : Ed Schilling, NASA Ames Research Center. Technique: High Definition TV imaging with long focal length optics. Scientific objective: To detect wake phenomena at highest possible spatial resolution. Instrument: Professional Sony HDTV Camcorder studio with broadcast quality low f-number zoom lens. 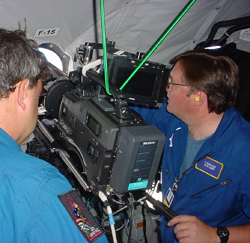 Heritage: This camera was deployed during the Genesis SRC entry observing campaign with a 9 inch Maksutov telescope and for in-cabin video during the 2002 Leonid MAC mission. Aircraft hardware requirements: Window swivel mount, electricity at window, stow box. Sensitivity: Depends on choice of optics and focal length.